AICN COMICS Opinions Are Like @$$Holes: The Crime Syndicate! AICN COMICS Opinions Are Like @$$Holes: Love FOREVER EVIL? Well, Masked Man’s Got Everything You Need To Know about The Crime Syndicate of America! AICN COMICS Editor Ambush Bug here. Sometimes the AICN COMICS @$$holes have more to say about comics that can be contained in one review. In those particular times we like to step up on our soapbox and spout words. THE CRIME SYNDICATE OF AMERICAThe World's Greatest Super-Villains! Let's face, everyone loves evil twins. They have been with us seemingly forever, and most likely always will be. Heck, I remember the episode of MALCOM IN THE MIDDLE when we found out that Dewey had a twin- but Dewey was the evil one! Probably the most famous evil twins (at least is geek-dom) were the evil Enterprise crew (Kirk and Spock, etc) from the STAR TREK episode “Mirror, Mirror”. Well three years before that, writer Gardner Fox and editor Julius Schwartz gave the DCU the biggest baddest evil twins ever, the Crime Syndicate of America. 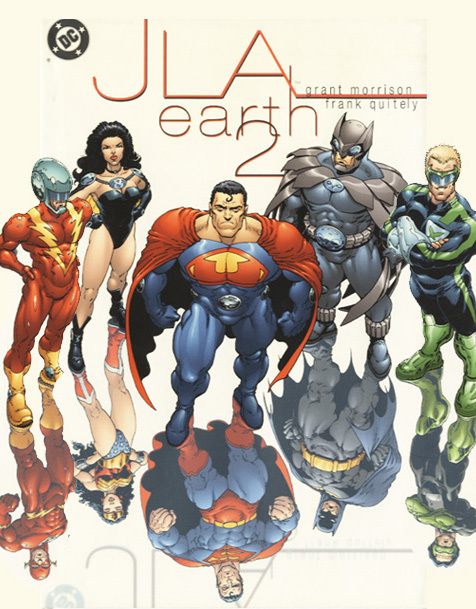 A few years earlier in THE FLASH, Fox and Schwartz created Earth-2. A way of explaining the how the Golden Age heroes and the new Silver Age heroes could co-exist. This proved very popular so the concept moved to the JUSTICE LEAGUE OF AMERICA and the first team-up between Earth-1's Justice League of America (Silver Age) and Earth-2's Justice Society of America (Golden Age) took place. Well just like today, if a big event sells, companies have to do it again, bigger and louder. So in 1964 they expanded the DCU with Earth-3 (logic enough). A world that was backwards, in comparisons to Earth-1 and Earth-2. England won it's independence from the USA, Lincoln killed US President Booth, etc, etc. 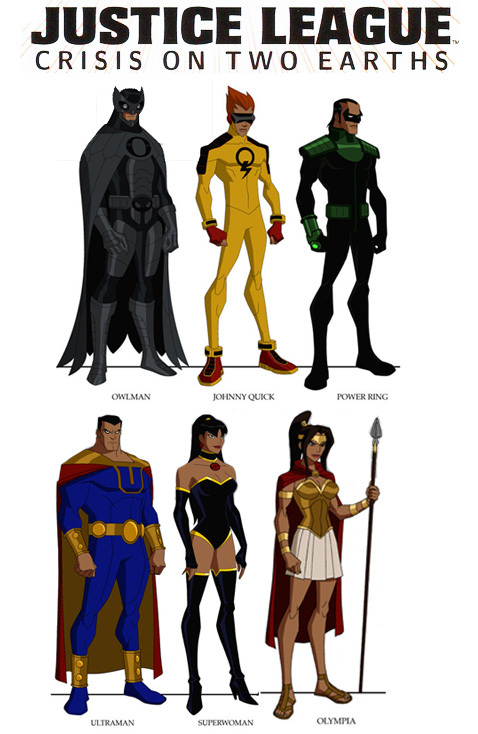 But worst of all, the premiere team of super-powered beings was the Crime Syndicate of America. 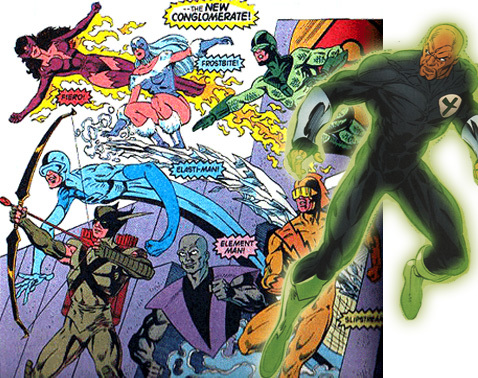 The CSA featured evil twins of the JLA and JSA: Ultraman (instead of Superman), SuperWoman (instead of Wonder Woman), Owlman (instead of Batman), Johnny Quick (instead of the Flash) and Power Ring (instead of Green Lantern). 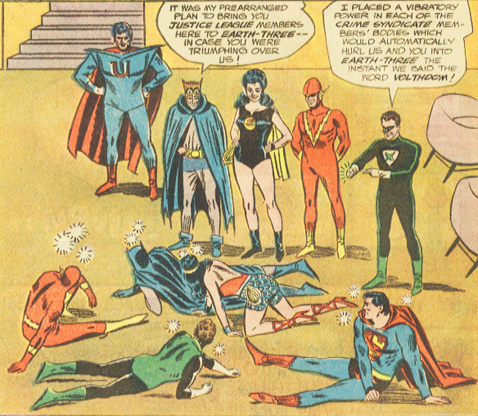 Looking for bigger kicks, the CSA attacked and defeated the JLA and then the JSA. You might think the combined powers of the JLA and JSA finally won the day, but you'd be wrong. It seems that each team had an unfair advantage on their world. So on Earth-2, to see who was really the best of the best the CSA and the JLA fought the final battle. And in true Gardner Fox fashion, the JLA tricked the CSA and won. After that more Earths were cranked out of the DC factory: Earth-X, Earth-S, etc. But the Crime Syndicate was almost never seen again. Not until 1978, where minus Ultraman and Owlman, they had a rather lackluster appearance in THE SECRET SOCIETY OF SUPER-VILLAINS (#13&14). In 1982 with DC COMICS PRESENTS Annual #1, Ultraman mixed it up with both Supermen and both Luthor's. 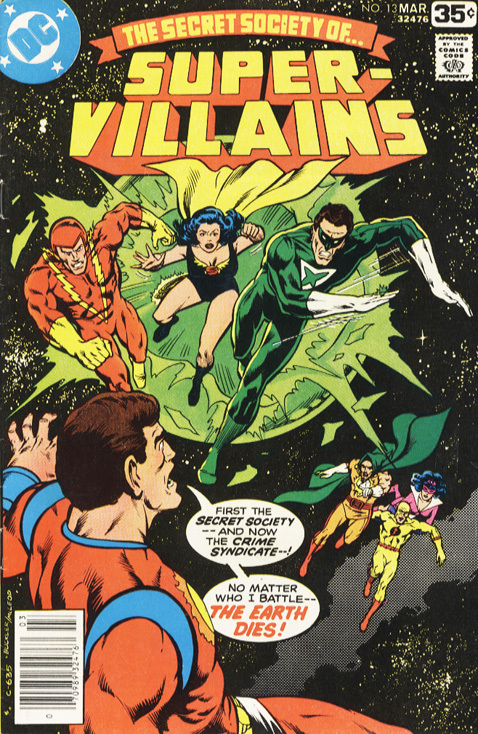 Writer Marv Wolfman also threw in Alexander Luthor, the only hero of Earth-3 (his son Alexander Luthor Jr. was a player in CRISIS ON INFINITE EARTHS and the INFINITE CRISIS). Writer Gerry Conway would bring the full CSA together for one more massive battle with the JLA and JSA in the JUSTICE LEAGUE OF AMERICA, “Crisis on Earth-Prime” (#207-209) before then were killed in the first issue of the CRISIS ON INFINITE EARTHS. Post-Crisis, writers interested in the CSA tried to come-up with non-Earth-3 origins for them, but best not to talk about that. It wasn't until superstar JLA writer Grant Morrison in 2000 was allowed to create a multiple Earth (something forbidden at DC for over a decade), a negative one in JLA: EARTH 2, that the CSA really returned. 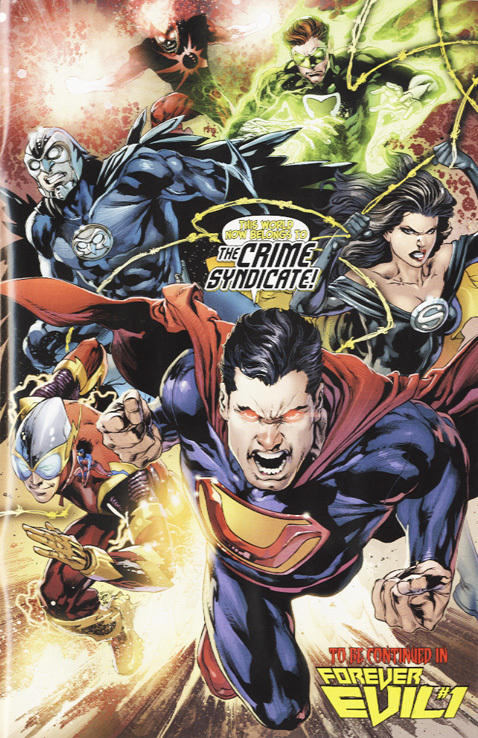 Morrison added his own spin to the character, revealing Owlman's secret identity, Thomas Wayne Jr and that Superwoman was also Lois Lane. With the return of the multiverse in INFINITE CRISIS, things got muddle again with the CSA. Seems that there were now two of them (oui). Then in 2011 DC recreated the multiverse again with the New 52. So there's a new Earth-2, with a new Justice Society, and a new Earth-3, with a new Crime Syndicate. Who, hit the ground running in FOREVER EVIL. For the most part the Crime Syndicate's roster has remained the same. But with each recreation of the DCU, writers have tried to update the team as well. Post Crisis, Mark Waid added twins of Blue Beetle, Fire and others to mirror the new Justice League. Grant Morrison continued that angle with younger versions of Power Ring and Johnny Quick, reflecting Kyle Rayner and Wally West. Kurt Busiek then created a 'John Stewart' for the Crime Syndicate. And when the Crime Syndicate finally got their shot to appear in animation, JUSTICE LEAGUE: CRISIS ON TWO EARTHS, writer Dwayne McDuffie added dozens of new members- he even down graded Princess Diana's to Olympia while Mary Baston's became Superwoman! So it's no surprise that Geoff Johns has decided to change up the Crime Syndicate as well, adding (briefly) Sea King (Aquaman) plus Atomica (this there even an Atom yet in the New 52?) and Deathstorm (Firestorm) (and seems that Johns and artist Ivan Reis really liked their undead Firestorm design from BLACKEST NIGHT). For me, the only 'real' members to add are Atom and a Hawkman. Because, seeing what Fox did, each member of the Syndicate is in the Society as well as the League. You could raise a good argument for Green Arrow and Hawkgirl, as they were both on Earth-1 and Earth-2, but neither were both members of the League and the Society. So characters like Hourman, Vibe, Mr. Terrific, and Zatanna shouldn't be in the Syndicate, because again they were never on both teams. But hey, the more the merry. The thing I find most interesting about the Syndicate, assuming the writers take this angle (which they usually don't), is these ARE the evil twins of the Justice League. So it should never been Thomas Wayne Jr. or whoever else. It should always be Kal-el from Krypton, Diana from Themyscira, Bruce Wayne, Barry Allen and Hal Jordan. The reason being is, if it isn't those five characters, then there's no real difference between the Syndicate and other super villains with similar powers to the League. A human astronaut getting the powers of Superman is not much more different than Cyborg-Superman, or Bizarro or Zod or Solarman. It's just another character with Superman like powers. Same with Owlman, if it's not Bruce Wayne, than he's no more unique than Wraith, Cat-man, Nighthawk, Nemesis or even some clone. What should make the Crime Syndicate special is that it IS Clark, Diana, Bruce, Barry and Hal! It's not just another villain- they are fighting themselves! This leads into why the Syndicate is and should be so feared. You see the League is the best of the best (or they were before the New 52), and not because of their powers or abilities, but because their belief. They believe with every fiber of their being that they have to succeed or life as we know it will end. Superman always manages to defeat adversities more powerful and more intelligent than him because he's more vested in winning than they are. The consequences are just too great to lose. The same is true for Ultraman and the Syndicate. They don't win because of their power, they win because of their belief. They believe with every fiber of their being that they are right, and life as 'they' know it will end if they lose. They have to win, they have too- the consequences are just too great not too. So now you have a super-villain team who is more than just another Injustice League (or Gang if you prefer) or the Secret Society. You have a team that is just as invincible as the League. So when they lock horns, (comic book rules aside) there's no telling what will happen and who could win. Batman is finally, actually fighting someone just as driven and talent as he is in Owlman. Because they are both Bruce Wayne and they both lost their parents (one to crime, one to justice). It's not Ali vs Fraser, it's Ali vs Ali- for real! No clones, no magic, the real deal and heaven help the DCU, because even Darkseid doesn't stand a chance against the Syndicate.